With Discovery deep in preparations for her STS-128 mission, shuttle managers are already mapping out the processing flow for her STS-131 flight – allowing for a smooth transition between the conclusion of STS-128 and her flow towards the 2010 mission. As with all flows, numerous modifications will be carried out on the veteran orbiter, as engineers continue to improve the health and safety of the fleet. As managers prepare for next week’s Space Shuttle Program (SSP) Flight Readiness Review (FRR), Discovery is pressing through the S0009 Launch Pad Validation proceedures – which includes the on-going Terminal Countdown Demonstration Test (TCDT). “APU 3 (Auxiliary Power Unit) hotfire was successfully completed at 0654L Wednesday morning. RSS (Rotating Service Structure rotation to the Mate Position was completed at 1055L Wednesday. Range Safety first motion checks were completed at 1915L yesterday,” noted processing information acquired by L2 on Thursday morning. Work is continuing on the replacement of Discovery’s left hand Solid Rocket Booster (SRB) Check Valve Filter Assembly (CVFA) – with a potential root cause found on hardware that failed during testing ahead of rollout to the pad. “LH SRB HPU (Hydraulic Power Unit) update: CVFA R&R was completed Wednesday. Initial inspection of the removed CVFA found a split o-ring and a displaced snap ring,” added processing information. A preliminary timeline of around a week has been scheduled for the replacement work, although another issue on the left hand booster has been observed. This issue is currently under evaluation, with an update due on Friday for any potential impacts this may cause on the pad flow. Currently targeting launch on March 18, 2010, Discovery’s STS-131 logistics mission to the ISS has undergone the Launch Site Flow Review (LSFR) at the Kennedy Space Center, resulting in a firmer understanding of the processing that will be done on Discovery when she returns from STS-128. According to the 89 page LSFR presentation – available for download on L2 – Discovery is tentatively scheduled to rollover to the VAB on February 9, 2010 for mating to her External Tank before rolling out to the pad on February 16. Once at Pad-A, Discovery will undergo 25 processing days and six contingency days of final flight processing before launch on March 18. Based on the latest schedules, Discovery was to begin processing for STS-131 on August 31 – the planned landing day of STS-128 as of early July. However, that date certainly will not hold seeing as how STS-128’s No Earlier Than launch date is August 25 or 26. Nevertheless, Discovery’s flow toward STS-131 is longer than the usual OPF flow – ~145-days vs. the minimum ~100 days a vehicle can be processed out of the OPF. As such, the slip for Discovery’s STS-128 mission will not dramatically affect the processing schedule for STS-131. During her stay in OPF-3, Discovery will have her APU2 (Auxiliary Power Unit) – one of three devices (APUs) that provide hydraulic power to the vehicle during launch and entry – replaced due to time and cycle requirements. Additionally, Discovery’s Main Propulsion System (MPS) PV 9/PV 12 will be replaced for the same reason. However, the first of several modifications that will be made to Discovery during her turn-around flow will be a the implementation of a redesign to the Rudder Speed Brake (RSB) Inconel Thermal Barrier tabs – tabs which provide thermal protection from the SRB and main engine plumes during ascent. 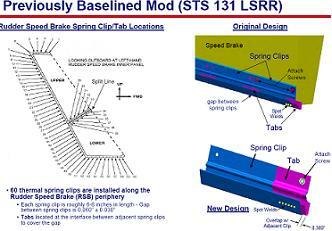 Stemming from a liberation event on Discovery’s STS-124 mission in June 2008, the modification of the RSB tabs “provides redesigned (RSB) inconel thermal barrier tab attachments to improve strength and durability,” notes the LSFR presentation. For the modification, all 60 tabs located on the RSB periphery will be replaced. An initial modification was made to the tabs following STS-124. However, that modification did not work as several tabs were found missing on the following mission (STS-126) during post-flight inspections of Endeavour in December 2008. For this modification, the fastening mechanism will be improved by increasing the number of “spot welds, shortening the overlap of each tab to 0.300,” and adding a secondary fastener via an increase in tab length. 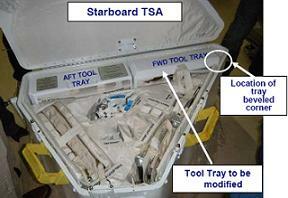 The next modification discussed in the LSFR is to the Starboard Lightweight Tool Stowage Assembly (TSA). 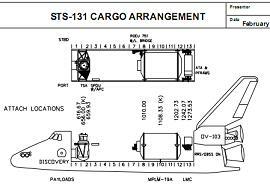 “Due to allocation of the two standard port lightweight TSAs to OV-104 (Atlantis) and OV-105 (Endeavour) and manifest delays, OV-103’s (Discovery’s) STS-128 flight required use of the starboard LWT TSA for stowage of standard contingency tools,” notes the review document. The orientation of the TSA to the upside-down position was necessary in order to properly mount the TSA to the Starboard location. This reversal now places the tray handle on the bottom. As such, the handle had to be removed to allow the tool tray to fit properly and allow the TSA lid to close. The handle will be relocated to the opposite end of the tray to place it in the proper position for the starboard TSA. The final approved modification at this time “Improves the damage resistance of the Aft Stub carrier panel tiles adjacent to the body flap” of the orbiter – which is parallel to the three Space Shuttle Main Engines. Historically, several damage locations in this area of the vehicle have been attributed to ground processing procedures. As a result of this realization a few years ago, eight tiles in the area were upgraded to reduce the risk of damage associated with ground processing. However, recent tile damage in this area has been seen on the tiles that were not modified. Furthermore, flight experience has shown that the tiles that were upgraded have performed very well. 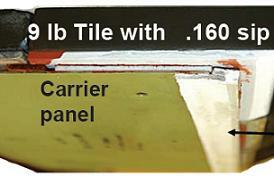 As such, the remaining tiles in this region will be upgraded for STS-131 and subsequent flights. This new material will have approximately twice the strength of the previous material. In addition to these modifications, several other configuration changes are under review for STS-131. Among these are an increase in the Boundary Layer Transition tile to 0.35” based on performance data from STS-128, a redesign of the Gaseous Hydrogen Flow Control Valve poppet following the event seen on STS-126, and a redesign of the F3D/F4D thruster cover. Also included will be a sneak peak of the Wing Leading Edge spar inspections, a redesign of the Wing Leading Edge Carrier Panel Horse Collar Gap Filler on panels 1-4, and a connector saver redesign of the OMS Pods and Ku-Band Antenna. Also under evaluation for the STS-131 are the delivery dates for Government Flown Equipment and the Flow Control Valves and the potential removal and replacement of the Multiplexer/Demultiplexer due to Wave Form Output.